Morton’s neuroma also known as Morton metatarsalgia or Morton’s toe is defined as a painful, peripheral nerve disease of the foot caused by swelling of the interdigital nerve in the heads of the metatarsal bones. It starts from a compression (neural entrapment) of the plantar nerves between the head of the middle toe bones and usually occurs mostly between the third and fourth metatarsal (toe) in the third interdigital space. This condition rarely occurs between the second and third toes, in addition, only up to 16% of cases report multiple Morton’s neuroma on the same foot. Morton’s neuroma is usually caused by irritation or compression of the interdigital nerve between the heads of the metatarsal and at the level of the metatarsophalangeal joints. In chronic compression, a nodular thickening occurs at its branching, a similar equivalent to histologically aneuroma. Compression of the interdigital nerve can also be as a result of an inflamed or enlarged bursa, a firm cyst can then form in the space between the heads of the metatarsal bones. 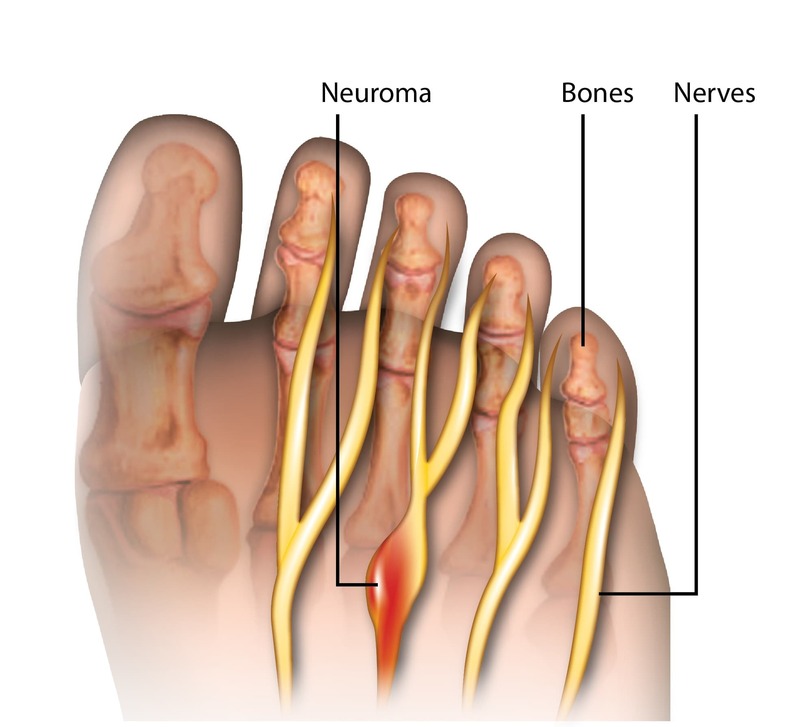 An external impact or trauma to the area can also cause neuroma to occur in the foot. The emergence of Morton neuroma can usually be preceded by the presence of other foot deformities such as splayed feet, bunions, flat feet or hallux valgus, in addition those with certain foot conditions such as which can also be caused by wearing unsuitable or tight shoes over a long period of time. In sports this condition is usually more prevalent in long distance runners and tennis players where there is a constant pressure on the ball of the foot. In coming weeks as the neuroma enlarges, more pain can be felt which is typically caused by the rolling motion of the foot. Pain becomes more prominent and may radiate down into the toes of the midfoot. Any individual that feels that he or she might have Morton’s neuroma based on the symptoms should visit a foot specialist such as a podiatrist. The doctor will then carefully examine the foot and ask questions in regards to the foot and the history of experienced symptoms. By identifying and receiving a diagnosis in the earlier stages, it makes treatment of the condition much easier, reducing the need for any surgical or invasive treatments. Conventional radiographs are not able to discover the visible changes in the feet caused y the neuroma. In this case a sonography or an MRI scan can help to detect any changes in the nerves along the middle of the metatarsals. Change in footwear (orthotics) – avoidance of narrow toed shoes or high heels are advised, instead wide toed and well fitted shoes are encouraged. Change in activity – abstinence of activities that put more pressure on the affected feet until the condition is resolved. R.I.C.E – Resting the feet, using an ice pack to relieve swelling, padded compression to support the feet and reduce pressure, keeping the foot elevated when not in use. Injections – Symptoms can be improved by the use of steroidal cortisone injection or local anaesthetics. Morton’s neuroma can usually be avoided by an individual taking active care of what they wear when competing in sporting activities or when walking long distances. It is also recommended to stretch the ankle and feet properly before any rigorous activities. Allowing for the full course of recovery before getting involved in vigorous activities is also suggested.